HostelBookers Prizes for Excellence 2010 - Rated top three for Greatest Value in Africa *Riad Marrakech Rouge is a colourful, traditional guesthouse inside the center of the medina, a few moments from Location DJema El Fna, in the center of the planet well known souqs. We offer great costs in lovely surroundings. The employees were awesome (especially Ali) I was here fore 1 week, on arrival we were made mint tea and cake, given a map with all of the critical employees to see and then shown our rooms. Being picked up from the airport, or at least arranging to meet with someone from the hostel is a must, as it will be very difficult to uncover the hostel otherwise (this is the same with all hostels in Marrakech as navigating the streets even with directions for the first time is impossible! ). I stayed in Marrakech Rouge 2 as the original hostel was full, Ali was extremely helpful and friendly, helping us arrange excursions (highly recommended by the way) and making a amazing breakfast inside the morning. Rooms were clean and spacious, no complaints. 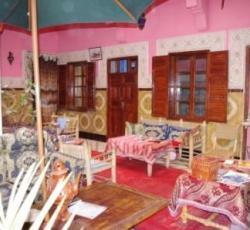 Hostel Riad Marrakech Rouge was one of the best hostels I&'ve ever stayed. The employees was really helpful and friendly. Breakfast, internet, tea, coffee, shisha was all included. The rooftop terrace is fantastic for a restful evening with fellow travellers. I really loved the atmosphere of this hostel. All the staff at the hostel (Ali, Pedro and Nasser) we&'re really warm and friendly and made our stay in Marrakech really nice. The hostel itself was really cool, and properly looked after! We had a really enjoyable stay at the Riad Marrakech Rouge. The setting is amazing, only the bathrooms are not really contemporary and leaking. Personally I don&'t mind. If your keen on sparkling facilities this is the only thing that&'s less great about this hostel. Very very good hostel, sociable atmosphere and great breakfast! Very helpful and supportive staff. I was injured and Hinds brought me to the medical clinic on her own time. Staff absolutely great felt like home from home couldn&'t do enough for us. Went back for two more days at end of trip. As soon as we arrived tea and biscuits given to make us feel welcome. * Riad Marrakech Rouge rated 4.67 out of 5 based on 9 customer reviews. Hostel reviews with a star rating are sourced from HostelBookers. If you find Riad Marrakech Rouge with the same booking conditions at a lower rate somewhere else on the internet after you have booked, we will refund you the total difference.